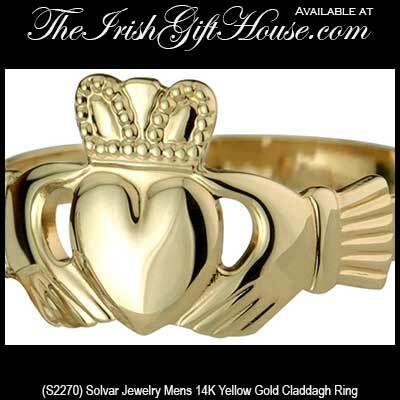 Men's Claddagh rings feature larger versions of the iconic Irish design. 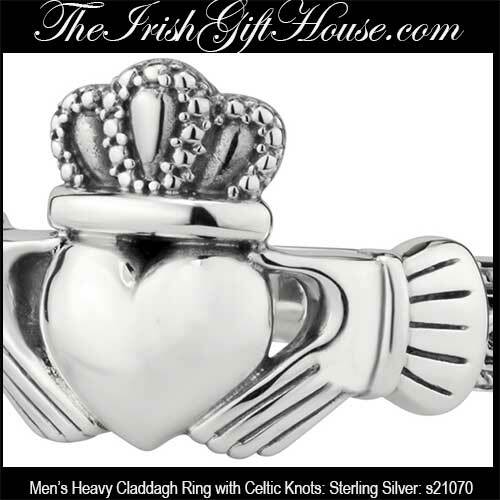 The masculine Claddagh rings are available in either silver or gold. Choose from traditional men's Claddagh rings or select one with Celtic accents or even precious or semi precious stones such as emeralds or black onyx. Each of these Claddagh rings at The Irish Gift House are a masculine expression of friendship, loyalty and love along with zeal for your Irish heritage. This 14K gold men's Claddagh ring features a Celtic knot band. This 14K gold men's Claddagh ring is a heavy weight design that features a puffed heart. This men's 14K gold Claddagh ring features a puffed heart. This men's 10K gold Claddagh ring features an emerald set in the heart along with diamonds in the crown. This men's 10K white gold Claddagh ring features a Celtic knot band. This men's Claddagh ring is cast in 10K gold and is enhanced with a Celtic knot band. This men's 10K gold Claddagh ring features a face with a longer design. This 10K yellow gold men's Claddagh ring is from O’Connor Jewelry. This thicker men's Claddagh ring in 10K gold features a black onyx heart. This antique style men's Claddagh ring is cast in 10K yellow gold. This men's Claddagh ring is crafted in 10K gold. This 10K gold men's Claddagh ring features an emerald heart. 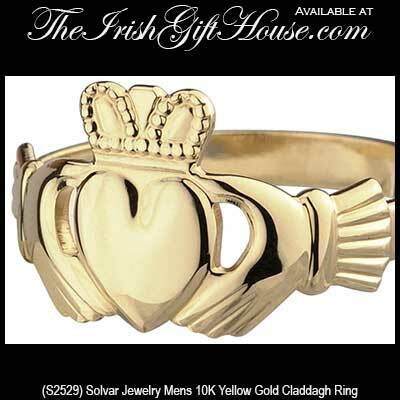 This 10K yellow gold men's Claddagh ring features a puffed heart. This men's Claddagh ring in 10K gold features a larger face. This men's 10K gold Claddagh ring features an emerald heart. This men's 10K yellow gold Claddagh ring is a light weight design. This men's Claddagh ring is a light weight design in 10K gold. This large and heavy men's sterling silver Claddagh ring features embossed Celtic knot-work on the band. This men's Claddagh ring is cast in sterling silver and it features a Celtic knot band. 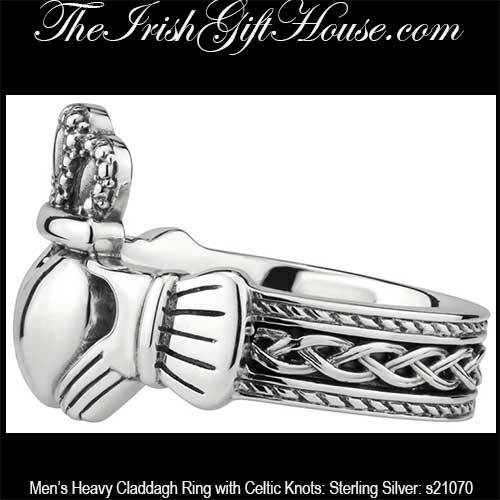 This men's sterling silver Claddagh ring features a Celtic knot band. Men's Sterling silver Claddagh ring is a heavy weight design that features Celtic knots on the sides. 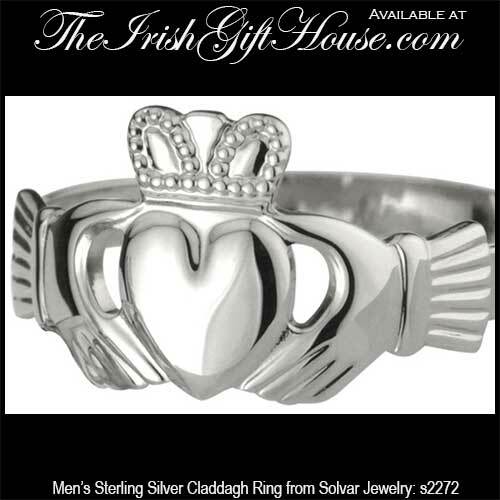 This men's Claddagh ring in sterling silver is a heavy weight design. 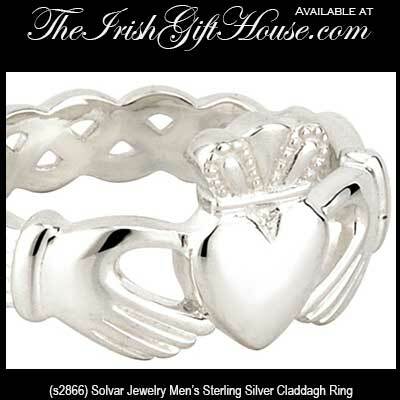 This classic sterling silver Claddagh ring is a heavy weight design and it is our best selling Claddagh ring for men. If you are still searching for an Irish ring to put on your man's finger we have additional masculine selections in our Claddagh wedding rings section; here you will find band style renditions of the famous Irish symbol that reflects love, loyalty and friendship. 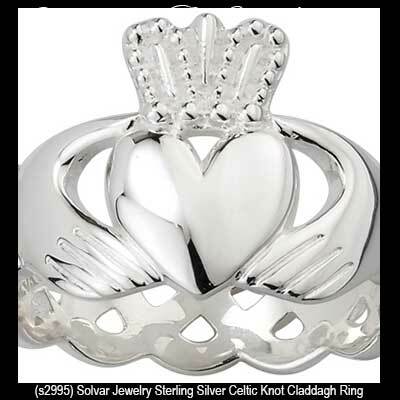 If you are interested in a feminine design you may wish to start by browsing our sterling silver Claddagh rings and the gold Claddagh rings sections; there is a great assortment available in both of these categories. We should also inform you about our vast selection of Celtic wedding bands if you are still considering different options. In this section you will find a tremendous selection that includes silver Celtic wedding bands. You will also find in various gold colors in our Celtic knot wedding bands along with the Trinity wedding bands; the never ending lines in these rings represent your unending love for each other. In addition to our Claddagh rings for men, one of our most popular manly sections is the men's Celtic cross necklace page; while not exclusively for guys, the Irish pendants on this page are burly and feature longer chains that are suitable for a man. You may also wish to explore our page that is dedicated to men's Celtic necklaces where you will find our selection of pewter style Irish jewelry. Also for the men is our collection of Irish and Celtic cuff links; we have over 30 different pairs that range from gold to plated designs. 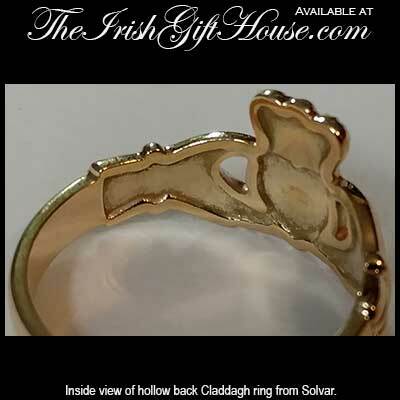 Our assortment of silver and gold men's Claddagh rings are made in Ireland by Solvar Jewelry, TJH and O'Connor Jewelry.